New Winter 2018: Here is one of the prettiest grandparents ornaments in our collection! 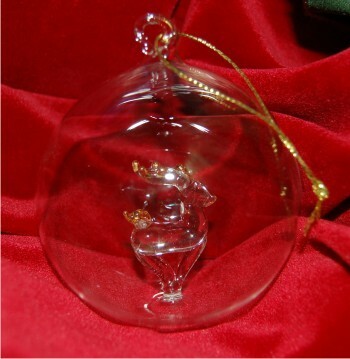 The for grandparents hand blown reindeer in glass Christmas ornament will be fully appreciated only when it arrives. It features a delicately crafted handblown reindeer with brilliant detail nestled in a glass globe with its own display cord. The total effect is one of quality and beauty, a grandparents ornament they will be pleased to display on the tree or on an ornament stand from Russell Rhodes. It is one of many grandparents ornaments for those who wish to put together a small collection for wonderful people this Christmas.